I read this as a chapter title in the book Essentialism (yes, that book :)! ). In the book the author was referring specifically to getting enough sleep but I think it applies to so much more. It doesn’t matter who you are or what you do. You are an asset to your family, your friends, your business and your community. Something of value. And what is value? Something of worth and importance. Something that is a priority, something you take care of and invest in. Your car is an asset. So you make sure you take it in for regular maintenance and when something isn’t working right you get it fixed. Your home is an asset. You probably have maintenance that needs to be performed on a regular basis. Your home has value so you make sure it’s taken care of. It plays an important role in your family’s comfort and care. Your money is an asset. You work hard for it. So you try and spend it wisely, invest thoughtfully, and save for the future. So… if you treat your car, home, and money as assets, do you treat yourself the same way? How To Protect You The Asset? 1) Tune In: Your body tries to talk to you each and every day, the trick is to listen in and interpret what it’s saying. Is it hurting, hungry, cold, too warm, or not feeling well? Taking time to check in and see how your body feels can help you start to notice areas that need to be addressed. 2) Sleep: Are you getting enough sleep? Sleep may seem luxurious but it’s vital in order to stay at peak performance and productivity. In fact I keep reading more studies that getting enough sleep is key to both. This article is one of the best I have read on the subject and it says it waaaay better than I can. By managing energy more skillfully, it’s possible to get more done, in less time, more sustainably. 3) Have Some Fun: When was the last time you took time to just to go have some fun? When was the last time you took the kids to the park? Went for a picnic? Surprised a friend with lunch? When was the last time I did that? Can’t remember. It was one of the perks of working from home I was looking forward too. Hmmm, something else to get back on the schedule. Engaging in an activity that you love is not only about feeling good, it’s a strategy for higher performance. 4) Creating Margin: Instead of cramming 15 things into a 15 minute block of time you (and me) need to do a better job of adding space into our daily life. Margin equals space, breathing room, buffers and boundaries. Creating margin also helps us escape the constant state of fight or flight we sometimes live in. 5) Retreat: There are times you have reached the edge, times where you need to take a step back and protect yourself. Retreating is not a bad thing. In fact there are times when it’s the only logical thing to do. The Bible talks about Jesus going away to pray by himself. That was his retreat, his escape from the crowds who surrounded him during his ministry here on earth. 6) Exercise: Oh the dreaded “e” word right? I don’t have time, I don’t have the right equipment, I don’t have the right clothes. Despite the excuses you still need to, even if you have to start by simply walking around the block or down your street a few times a day. The items listed above are simply starting points. There are areas you do well in and others that need attention. As an asset you are worth investing in. You are worth making time for and worth setting boundaries around to protect. The demands on your time and energy seems to increase each year. It can develop slowly over time so that you don’t even notice until you are burning the candle at both ends and burning out. Make a list (and check it twice…) of areas where you currently invest in yourself and list the benefits you experience as a result. Then make a list of areas where you are not investing and list the consequences. Pick one area and start investing this weekend! Call it “Asset Protection” on your calendar. As they say on the airplane… put your oxygen mask on first before assisting others! In order to make the biggest impact in the lives around you, you need to be at your best. 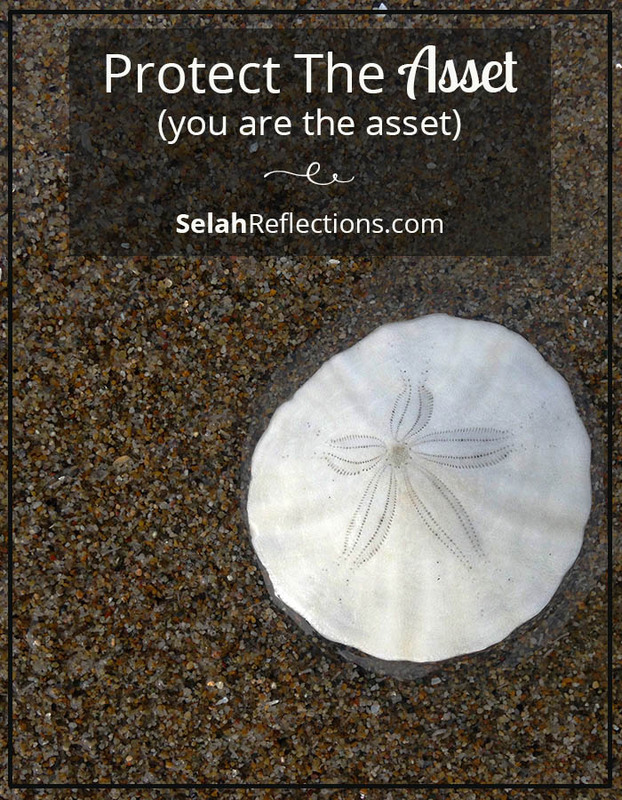 To be at your best requires protecting and investing in you, the precious asset.